"I'm Paula Smith, SVP, Research. Dave is VP, Market Research and Maya is VP, Quantitative Trading. Can we call you Sheena?" "Sheena, take a look at the graph and tell us what kind of trend you see." "First off, thanks for displaying the actual Y values, instead of a generic Y axis. Makes it easier. Though it starts off as a linear trend, it becomes slightly backward-bending after age 64, thus making it an exponential trend." "Sheena, is there a way to prove that - quickly? This graph is set up on that corner laptop. We'll return in five minutes." "Okay, Sheena, ready for us? Show us what you did." "Yes. I've added two trendlines - linear and exponential with respective r-squared. You can see the r-squared associated with the exponential trend is significantly higher (in basis points / not shown here) than its linear counterpart." "Dave, do you have any questions for Sheena?" "Thanks Paula. 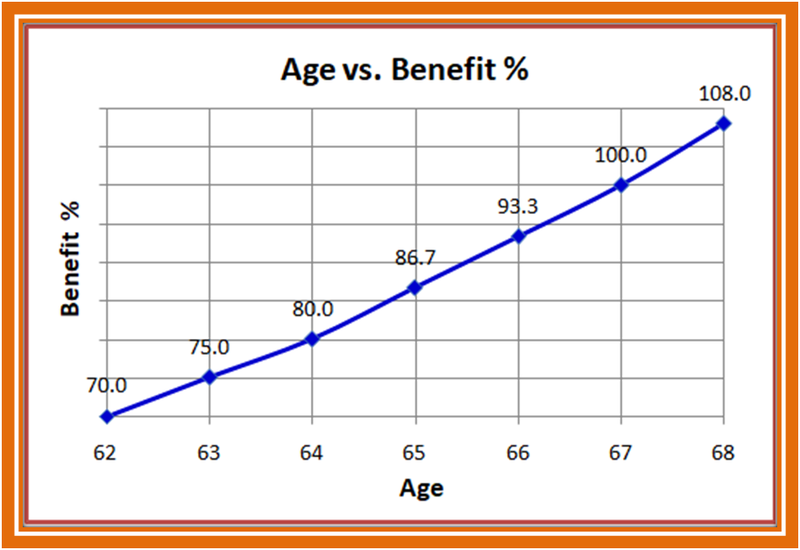 Sheena, if we reverse the trend to encourage early activation of benefits (leading to early retirements), will the trend change?" "Yes. The trend will be forward tilting, so I will fit a logarithmic trendline." "Maya, any questions for Sheena?" "Yes. Thanks Paula. Sheena, if you are advising a group of seniors evaluating activation, what would your two best pieces of advice be?" "First advice: Instead of activating at age 64, I will advise them to activate it at 65 (the first inflection point when the curve tilts up, i.e. the marginal growth rate exceeding 8% for the first time). 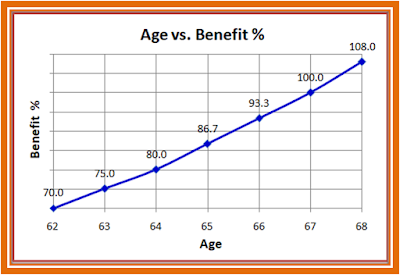 Second advice: Instead of activating at age 67, I will ask them to activate it at 68 (the second inflection when the mrginal growth rate re-hits 8%). "When can you join, Sheena? You will be an excellent addition to our Research Team!" Granted, it's never that easy to land a great job, but you get the point.